Biscuits were also an important part of the student experience. If you’ve ever sat around a drafty student house procrastinating about an essay, trying to find an excuse for another break and wondering if it would be completely disgraceful to watch Neighbours for a second time that day, you might know what I mean. Biscuits become a symbol for break time, an inexpensive treat to bribe yourself through an unstructured working day and, above all, an excuse to sit around the kitchen and catch up with your housemates. One of my most abiding biscuit-based memories from university involves a pack of Tunnocks Marshmallow Teacakes. One afternoon I arrived back from a tutorial to find one of my friends on the sofa with an open pack of teacakes and little balls of silver foil on the floor all around her. She’d already eaten four of the six and, despite complaints of ever-so-slight nausea, was resolutely peeling open a fifth explaining that if she ate them all now, at least she wouldn’t have the temptation of eating them tomorrow. Within the next couple of minutes she’d finished the whole packet and collapsed in a sugar-fuelled fit of giggles, all thoughts of working or essays completely out the window. The effect of this episode is that I now seem to think it’s socially acceptable to eat my own bodyweight in marshmallow teacakes at one sitting. When I made this miniature batch over the weekend, Carnivorous Fiancé and I managed to make fifteen disappear in about as many minutes, although I have to stress that they’re pretty tiny and consist largely of air in the form of creamy whipped marshmallow. I hadn’t thought about marshmallow teacakes in years but was inspired to give them a go after seeing them featured in an episode of The Great British Bake Off. Not being in possession of rounded silicone moulds, and feeling that their purchase might be a slight indulgence for making a single recipe, I decided to free-style it, taking inspiration from the gorgeous little ‘kisses’ on Helene’s inspirational food and photography blog. After her recommendation of spreading each biscuit with a little peanut butter, I experimented with speculoos or biscoff spread and a new favourite biscuit in the little loaf household was born. If you’ve not made or eaten these before, I urge you to give them a go. Making marshmallow sounds a bit scary but involves nothing more difficult than whisking egg whites with sugar and golden syrup over a low heat for a few minutes. The biscuits are a doddle and, while coating each little bite in chocolate is more than a little messy, it’s actually very easy and the more mess you make, the more chocolate there is to lick off your fingers. After all that sugar, things got a little bit silly . . .
One last thing before I share the recipe with you. I mentioned that we managed to go through fifteen teacakes in one afternoon, largely testament to how delicious and light these little bites are. 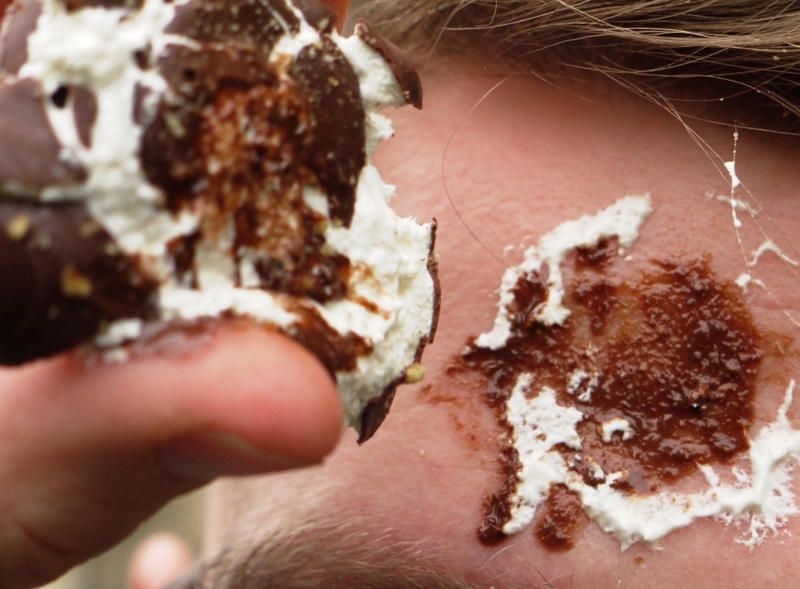 It’s also because we were having A LOT of fun smashing the teacakes against our foreheads in true Tunnocks tradition (the idea being to see if you can break the chocolate shell without covering yourself in creamy marshmallow). I’m pretty sure it’s a known thing as both Carnivorous Fiancé and I had heard about it from childhood, but if you’re not from the UK (or even if you are and aren’t aware of this tradition), you may well think we’re mad. Carniverous Fiancé fails the teacake test . . .
Eat them all in one sitting, smash them against your forehead like a crazy person or simply enjoy them for what they are. I don’t really mind what you do with these teacakes, as long as you try making them. It’s a lot of fun. Sift together the flours, salt, baking powder and caster sugar then rub in the butter with your fingertips. Add the milk and stir everything together to form a smooth ball. You may need a little more or less milk – you want a smooth, pliable dough without it being sticky. Pat the dough into a flat oval then dust the work surface with flour. Roll the dough to approx. 3 – 4mm thick. Cut out small rounds – I don’t have a cutter so used the top of a champagne flute but you can make any size you like.The champagne flute makes about 30 biscuits. Place the rounds on board and chill in the fridge for 10 minutes – this should stop them from shrinking when baking. Bake the biscuits for 15 minutes or until crisp. 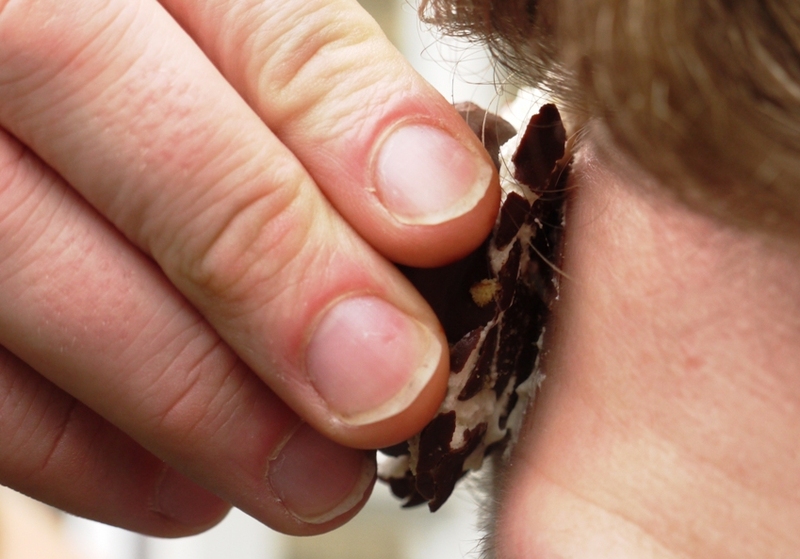 You don’t want a soft texture as a crisp base is important in a teacake. Place all of the ingredients except the speculoos spread in a large heatproof bowl set over a pan of simmering water (make sure the bottom of the bowl doesn’t touch the water). Whisk the mixture with an electric hand whisk for 6-8 minutes until it is smooth, silky and doubled in volume. The trick is to have a good, stiff texture so that the marshmallow holds when piped, without overcooking. A thick whipped cream consistency is ideal and you’ll know you’ve gone too far if the mixture takes on a grainy or scrambled egg-like texture. Spoon the marshmallow into a piping bag. 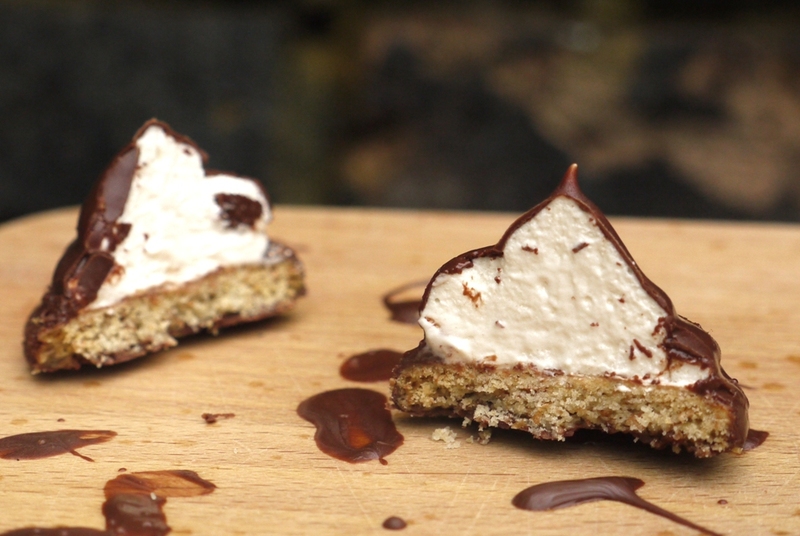 Spread each biscuit with 1/4 to 1/2 a teaspoon of Speculoos then pipe a swirl of marshmallow on top. Repeat with all the biscuits, then leave to set at room temperature for two hours. When ready to assemble, line a couple of trays with a silicone mat or baking parchment. 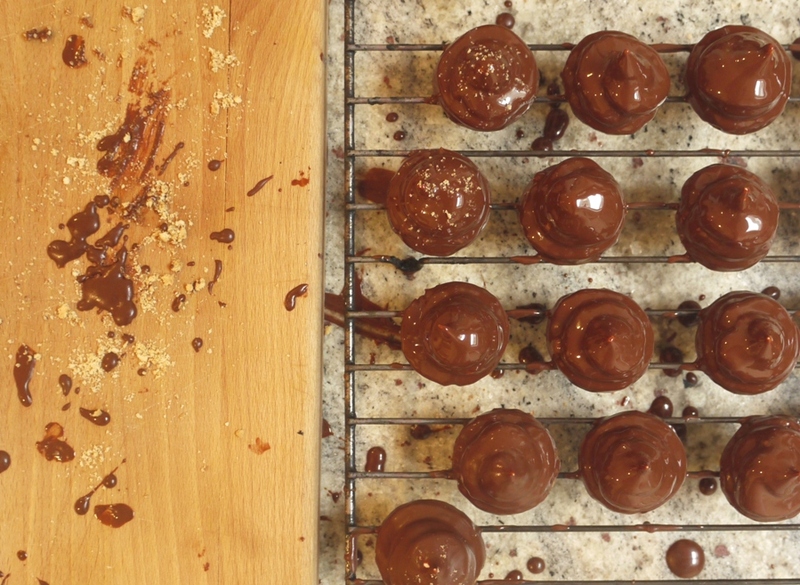 Melt the chocolates and vegetable oil in a heatproof bowl over a pan of simmering water. Set aside to cool slightly. To coat the cookies, you can drop each one into the chocolate and spoon it over the top to cover completely, or dip then hold upside down to allow excess chocolate to drip off. I was worried that my marshmallow might fall off the biscuit, but it seemed to stick pretty solid and the second method worked best for me. Place each chocolate-coated cookie on the prepared tray and leave to set at room temperature, about one hour. These teacakes keep best at room temperature in an airtight container. If you put them in the fridge the chocolate may discolour. These are amazing! Not only fun to make but fun to eat too! 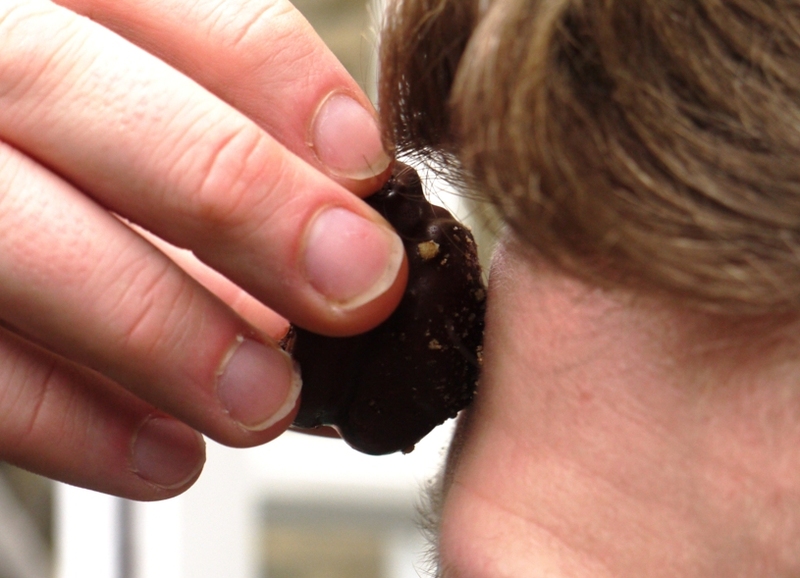 I have never heard of smashing a teacake against your forehead…I will have to try that! Everyone seems to be going teacake crazy since GBBO! 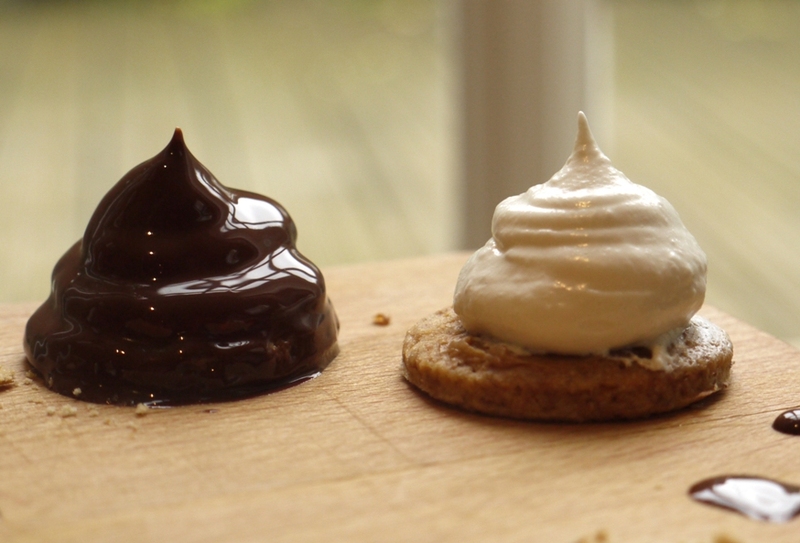 Where do you find biscoff spread in south London? Oh good timing I was in Waitrose this morning and remembered Helen saying you can buy Speculoos there now. So, I did! I have just tried it & can’t believe how good it is. Now I must make these, they sound amazing. look at the shine on that chocolate!!!!! Errr, the forehead thing obviously passed me by! Your teacakes look fantastic though. Teacakes have been on my list since I got the Peyton & Byrne book, but I keep saving it up for “when I have the time to experiment” which mysteriously never seems to occur. Nickki – it’s delicious, do try to hunt some down. Kathryn – you definitely should! My Dear Bakes – thank you. Lorraine – do it now! Laura – isn’t it delicious? Always feels a bit naughty having it on toast though so it’s nice to incorporate into something that doesn’t even pretend to be healthy. Milli – I added a little vegetable oil, keeps it lovely and glossy without tempering. Choclette – people are so divided on this one – some people think I’m mad and some people know all about it! I’ve seen lots of replications of the Peyton & Byrne recipe on the internet and they all look like the biscuit base it thick and soft rather than crisp. But each to their own! So pretty. I think they look much nicer than the dome ones. I bet they’re much tastier when homemade too – love the speculoos idea. And I’ve definitely never heard of the face thing..! Oh my goodness. I have to make these! These look delicious! Nice job! Ooh. These look fantastic! I love it. Emma – thank you. Making them in miniature is perfect – lots of fun dipping each biscuit and twice as many to eat! Anna – I’m sure I’ve seen some recipes out there… My blender is broken at the moment but once it’s fixed I may well investigate! Promise to keep you posted. 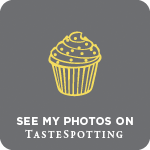 Kavey – hooray for spreading strangeness (and speculoos)! Amy – so pleased we’re not alone! I love the sound of these teacakes! Although, I’m not familiar with smashing it against your forehead, LOL!! 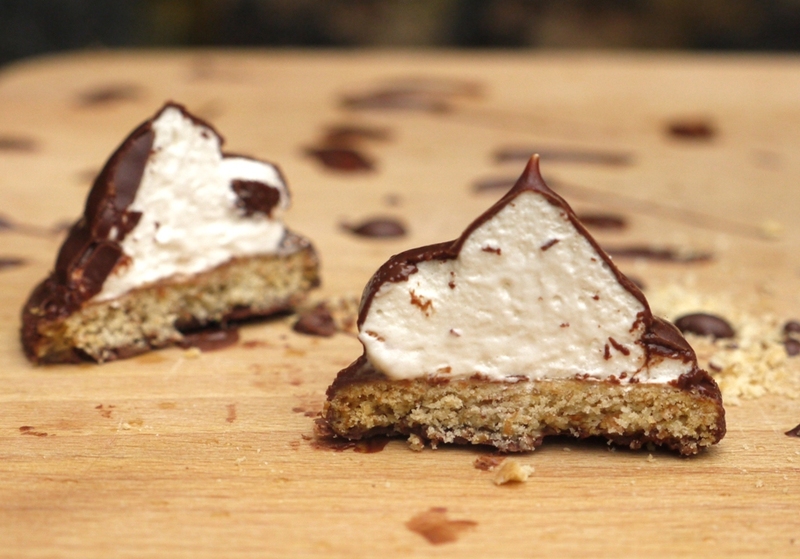 I’ve never attempted marshmallow at home before … something I must try soon. Well I’ve learned something new, I can’t say I’d ever heard of smashing teacakes against your forehead before! I like your version much better than the one of GBBO. Thanh – it was much easier than I expected and the results were lovely – light without being plasticky or too chewy like the marshmallow you get in the shops. Urvashi – ahh, thank you! Ilva – I don’t have children yet, but when I do I’ll definitely use them as an excuse! I too rather enjoyed the teacakes whilst at university. I have been toying with the idea of making something like this especially after the GBBO but i rather like your variation so will be trying it out.